AT PERFORMANCE VAUX OUR AIM IS SIMPLE. TO PROVIDE YOU WITH GREAT CUSTOMER SERVICE AND QUALITY SALVAGE VAUXHALL PARTS AT PRICES THAT CAN'T BE BEAT. WE ALWAYS HAVE A LARGE VARIETY OF VAUXHALL PARTS AVAILABLE SO PLEASE REMEMBER TO CHECK OUT OUR OTHER ITEMS. Genuine Vauxhall Astra 2.2 16V Z22SE Petrol Engine In good condition and full running order. 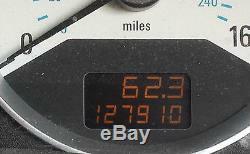 An ideal replacement for faulty units Has covered 127,910 miles. Block and head still timed together, with sump pan and rocker cover. All other external ancillaries have been removed. If you have any questions please do not hesitate to contact me. The item "GENUINE VAUXHALL ASTRA G MK4 2.2 16V Z22SE PETROL ENGINE 127K VECTRA/ZAFIRA" is in sale since Sunday, February 12, 2017. This item is in the category "Vehicle Parts & Accessories\Car Parts\Engines & Engine Parts\Complete Engines". The seller is "performance-vaux" and is located in Coventry. This item can be shipped to United Kingdom.